A painting of the battle, while Hudson (foreground) steamed towards the stranded Winslow (background). 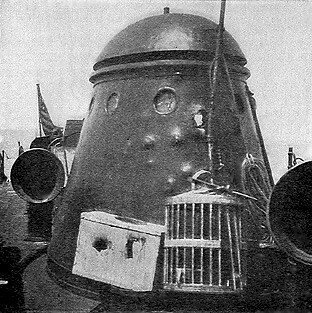 One can see the crew firing the 6 pounder cannons from both decks while being fed ammunition. This is the second verse of the creed of the United States Coast Guardsmen. It is used to teach recruits to respect the history of the service, and to understand on whose shoulders they’re standing. 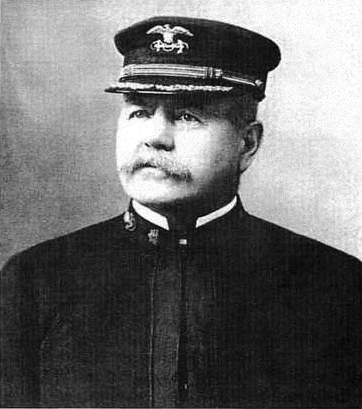 Captain Commandant Frank H. Newcomb was one such expert seaman. Frank Hamilton Newcomb would go on to lead the USRC Hudson while saving the USS Winslow. He was a seaman through and through and had a very strong sense of moral duty. He served in the American Civil War, and later the US Revenue Cutter Service even establishing the first all African American life-saving station. His sense of duty and morality can serve as an example to us all. Born in Boston in 1846 to a sailing family, Newcomb was destined for a life at sea. His father had first commanded a ship at 20 years old, and at 16 years old Frank served under him. But as the young man was getting his sea legs, the American Civil War was raging, and he knew he had to serve. He applied for, and received, a position as a Master’s Mate in the United States Navy in 1863, at only 17 years old. After the war, he returned to the merchant fleet. But much of the shipping had been taken over by foreign ships and sailors, and there wasn’t much money to make as an American. Newcomb had a spell on land, dabbling in railroads and various other endeavors. But by 1873 the sea was calling him back, and he joined the Revenue Cutter Service as Third Lieutenant. He served with distinction and was well liked by his peers and crew. Having spent his youth among Boston sailors, he felt at home on a ship and knew the hard working ethics of New England merchantmen. 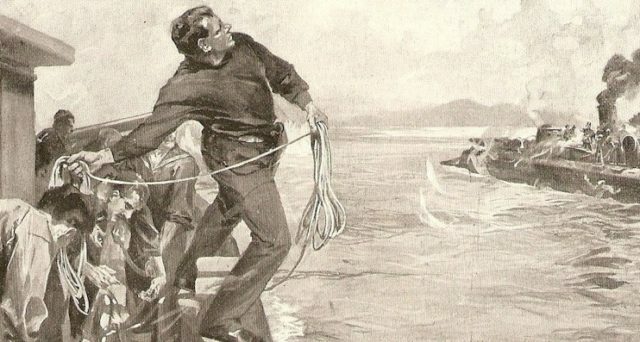 In 1878 he was offered a new opportunity: an inspector for the U.S. Life Saving Service. This new branch of the Treasury Department was tasked with manning and maintaining lifesaving stations across America’s coasts. But it suffered from corruption and dereliction. 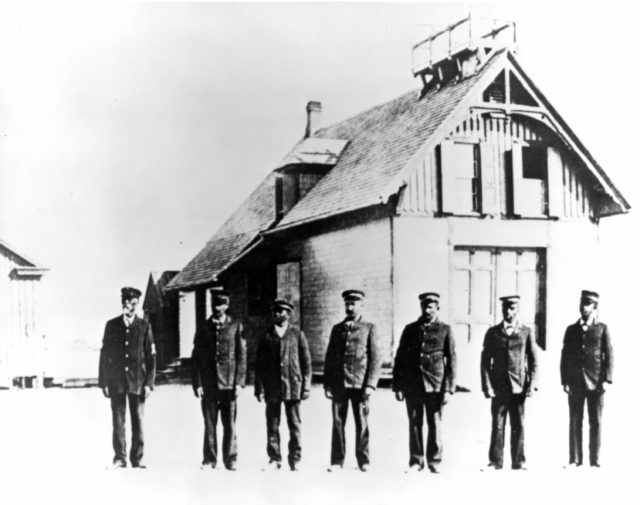 Again Newcomb proved himself a hard-working and ethical man, even establishing an all African-American lifesaving station, at Pea Island in North Carolina. This was a bold move in the American South just after the Civil War. But Newcomb had a strong sense of moral duty and knew that you must always do the right thing. By the end of the 19th century, Newcomb would prove this principle in battle. The Pea Island Life Saving Crew. Newcomb’s dedication to doing what he thought was right extended from fighting racial prejudice, to saving the lives of shipmates. For the next 20 years, Newcomb served on a variety of Revenue Cutters, in both the Atlantic and Pacific, and even off of Alaska. He was a cutterman through and through. 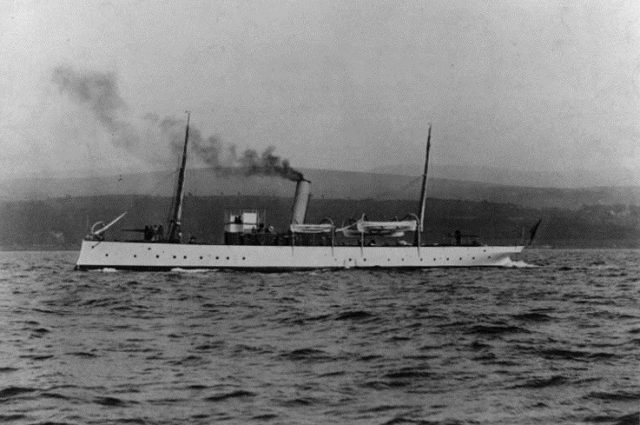 In 1897 he received a new command: the new Revenue Cutter Hudson. The service’s first all steel hulled vessel, the Hudson resembled a large tugboat. She wasn’t fast, nor was she particularly beautiful, but like the men who sailed her; she was stout, reliable, and dedicated. He came on board in September, as tensions with Spain were brewing. They finally boiled over in April of 1898, when the United States declared war on Spain. Almost immediately, Newcomb and Hudson set sail for Key West, where she would join with the rest of the American fleet. 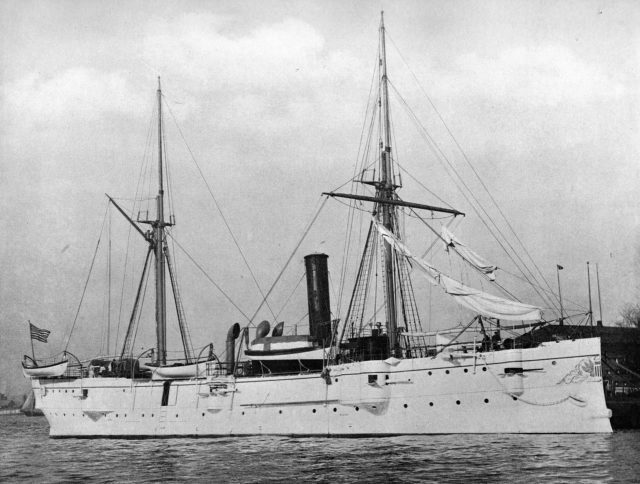 USRC Hudson at Navy Yard, Norfolk, Virginia April 21, 1898. In Key West things started happening very quickly. The Hudson arrived on May 5th, 1898, and by the 9th she had set sail for Cuba. Her duty was to patrol between Cardenas and Matanzas, hoping to draw the Spanish out of their fortified and well-defended harbors. On the 10th Newcomb found a small clear channel leading to the port of Cardenas, all others being blocked by debris and mines. The channel was only deep enough for a low draught vessel at high tide. The next day a small group of American ships steamed out to the channel. 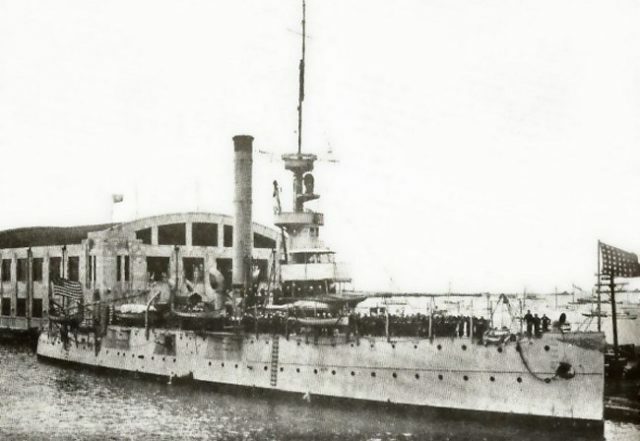 Thy consisted of two gunboats: USS Machias, and USS Wilmington, the torpedo boat USS Winslow, and finally the USRC Hudson. Machias sat too low in the water, and couldn’t pass through the channel, so Wilmington, Winslow, and Hudson proceeded while she provided covering fire to keep down snipers on the land. The three small boats proceeded slowly and cautiously up the channel, they knew the Spanish forces were ahead of them, but they weren’t sure where. Finally, the three Spanish gunboats at Cardenas came into view, and the three American ships stopped about 3,500 yards off the harbor. Winslow approached to scout out the situation. 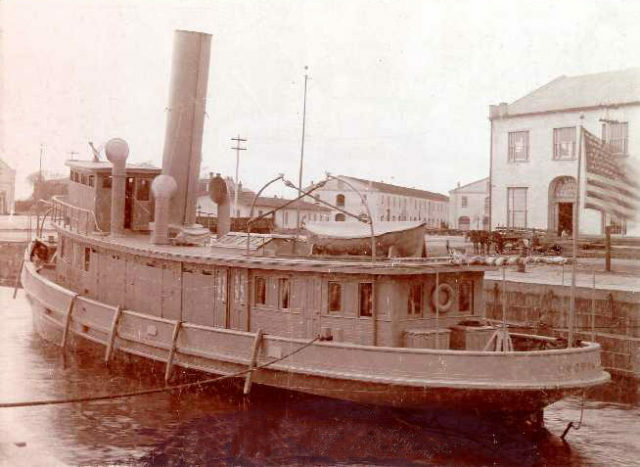 The Spanish gunboat Pizarro, who was damaged at the Battle of Cardenas. She was advancing stern first, hoping to use her aft facing torpedo tube to sink a gunboat, then make a speedy getaway. The tension must have buzzed through the air, as the crew anxiously watched the harbor grow larger. At 1,500 yards off the shore, the little torpedo boat realized she had made a terrible mistake. The water had started to get very shallow, and Winslow had to stop, but she was now sitting between two white ranging buoys. The Spanish gunners on shore used these as target practice, and already had their guns dialed in for their position. Suddenly the air was full of Spanish shells and the deafening roar of gunfire. Aside from her torpedoes the Winslow was armed only with rapid fire 1 Pounder cannons. These were the perfect armament for harassing ships of the same size, or enemy merchants. But they would do little against stone fortifications or an armored gunboat. The Winslow crew returned the Spanish fire, but soon found it fruitless. Not only were they outgunned, but the Spanish were using smokeless powder, making it much more difficult to spot their firing positions. The severe damage to the Winslow’s conn. The Hudson and Wilmington were sitting 2,000 yards away from the Winslow, watching in horror as their fellows were pounded by enemy fire. Knowing that he had to do something Newcomb requested permission to move in to assist the Winslow. He took the Hudson steaming forward, while the Wilmington, with her larger guns, provided support from a distance. While Hudson’s cabin and pilothouse had been armored, her guns were all exposed. Her crew stood on the fore and aft decks, firing her rapid six-pounder cannons as quickly as they could. All the while Spanish shells fell about them, throwing plumes of water skyward, if only to remind the American sailors of the sheer power each round possessed. While Hudson approached Winslow, the wind picked up. 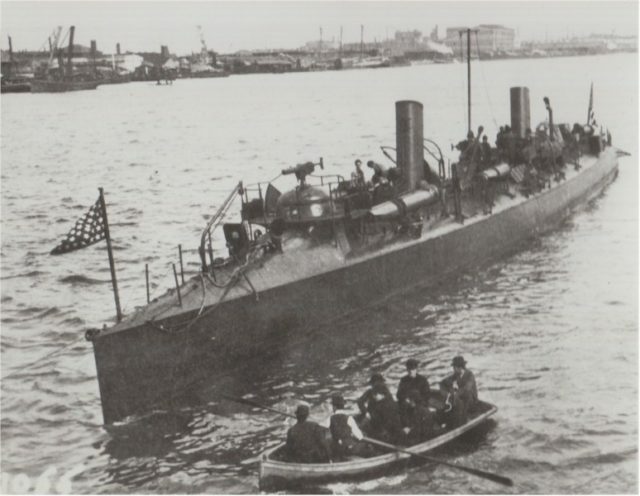 The torpedo boat’s steering had been knocked out, as had her smokestack and conn. She was now crippled and being blown towards the shallow water. Newcomb realized what was happening, and pulled the Hudson in close to haul her out. While he was approaching, a Spanish shell killed the Winslow’s executive officer, Ensign Worth Bagley, and an enlisted sailor. They became the first American casualties of the Spanish-American war. 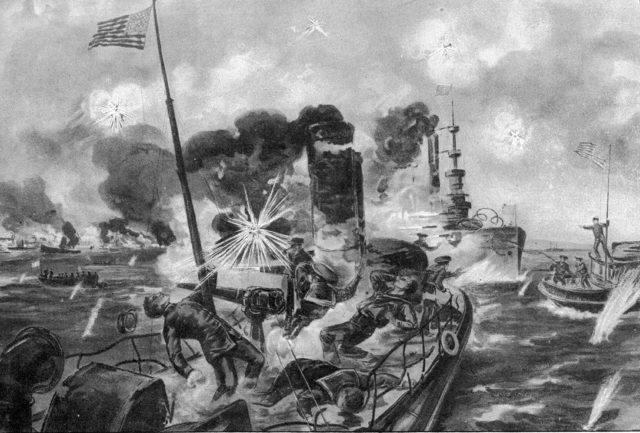 A contemporary artist’s depiction of Ensign Bagley’s death. Spanish fire had picked up, and the Hudson returned everything she could. Her two six-pounder cannons succeeded in firing 135 rounds in 20 minutes, pouring almost everything she had into protecting her fellow ship Winslow. 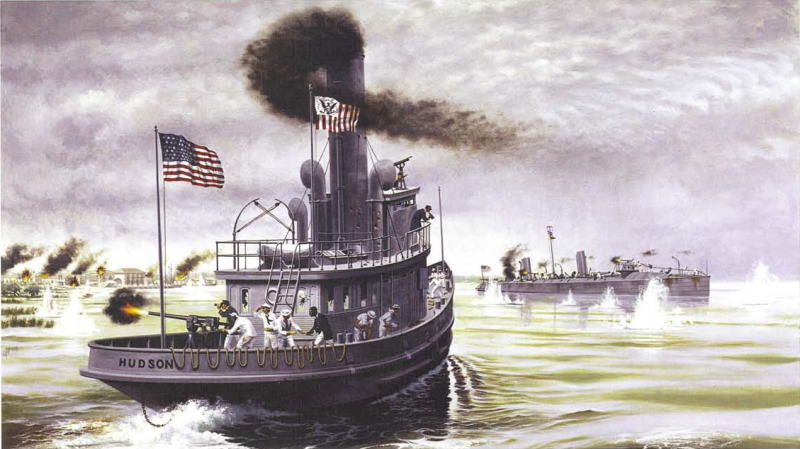 While under heavy fire, Hudson’s crew stood out on deck, attempting to heave a line across to the Winslow. Securing a towline is difficult to do in normal conditions, but doing so while under fire, and next to a gun crew pouring lead back at the enemy, is nigh on impossible. After 30 minutes, though, the skilled crews of both ships got a line from the Hudson on to the Winslow. The Revenue Cutter turned about, and while still firing continuously pulled the small Navy ship from the muddy shallows, and certain death. The three American ships pulled out and away from the combat, battered and tired but proud of their actions that day. An artist’s depiction of Hudson’s crew heaving a line to the Winslow. Frank H. Newcomb was awarded the Congressional Gold Medal. His five officers received Congressional Silver Medals, and the enlisted crew of the Hudson received Congressional Bronze Medals. This marked the first time in Revenue Cutter Service history that African Americans were awarded medals for bravery in combat operations, as two black men, Henry Savage and Moses Jones, had fed ammunition to the guns during combat. The specially minted gold medal for the Battle of Cardenas, awarded to Lieutenant Frank H. Newcomb. Frank H. Newcomb went on to be Captain Commandant of the US Revenue Cutter Service. By request of a Vice Admiral Russel R. Waesche, a destroyer was named after him, USS Newcomb (DD-586). While his story isn’t well known today, he truly is a part of that “long line of expert seamen,” and more than earned his place in history.